Time for more hug a book bookmarks!! 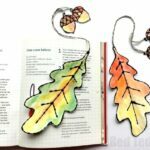 We love Hug a Book Bookmarks as they are simply so CUTE!!! 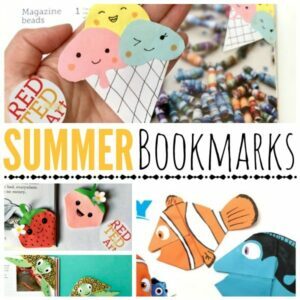 Today’s theme is all about mermaids – a perfect summer bookmark don’t you think? 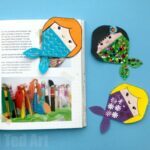 I was challenged by my friend over at The Origami Tree to make a mermaid bookmark, and I thought the “Hug a Book” Bookmark format would we just perfect for mermaids. Jenny, at the Origami Tree had a go at making Origami Mermaids (check out her video below!). As per usual, I do show you how to make your own mermaid from scratch, but this time I have also include a template to help you with the “parts”, as well as a print and colour version of you too! 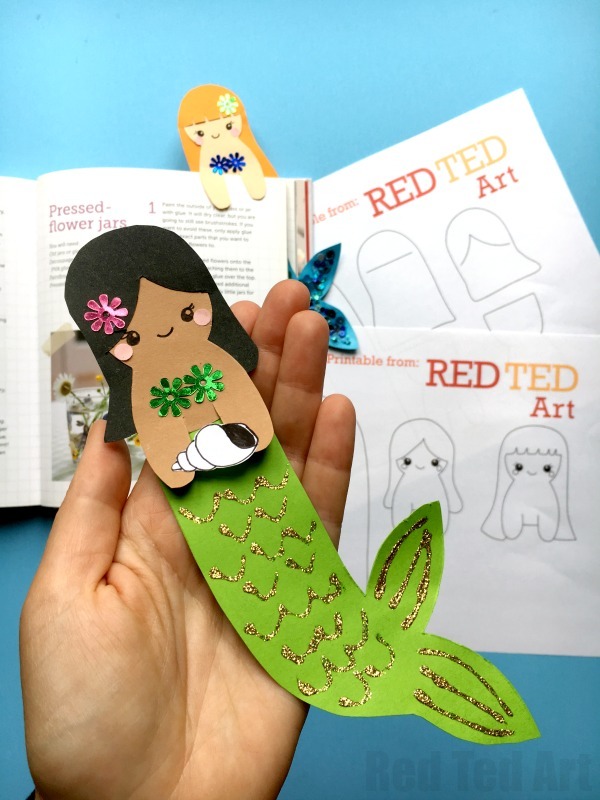 I hope you like our Hug a Book Mermaid Bookmark DIY and that you have go too! 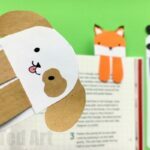 If you fancy more Bookmark Ideas we have lots more, including a great set of Bookmark Corner Designers. 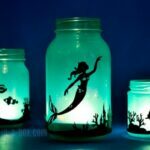 Hooray for Mermaid Craft Ideas!! 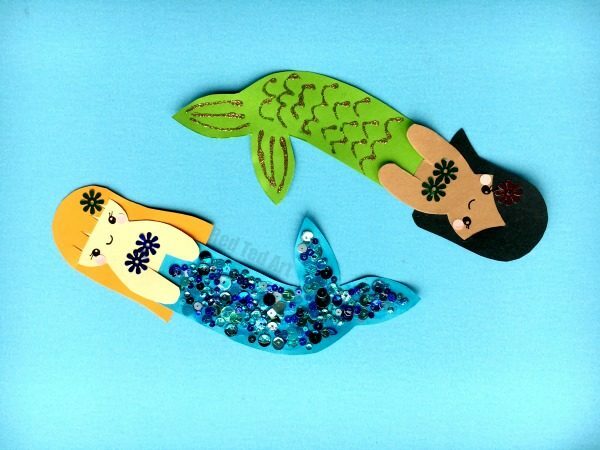 You may also want to check out our seriously cute Mermaid CORNER Bookmark Designs! As per usual we have a handy video showing you how I assembled these cute little paper mermaids. After I finished making it.. my daughter suggested I added a little shell to one of my paper mermaid bookmarks. Which I did and thought was super cute – but it is “missing” from the video or templates. Below is a short description providing written instructions as to how to assemble the template and/ or coloring pages! 2. 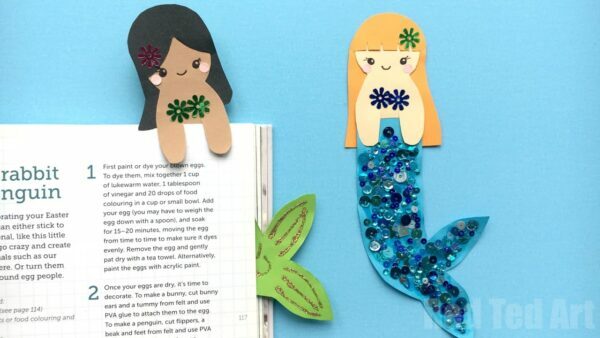 Your mermaid’s head has “two arms” that you need to “snip” – this the part of your bookmark that later “pops over your page” in the classic Hug a Book style. 3. You now need to glue your paper mermaid’s “head” onto the mermaid’s tail. Add lost of glue to the back of the bookmark but NOT THE ARMS. They need to be “free”. I glue it on, so that the head is stuck down “fully on the tail” – this makes your bookmark thicker and more sturdy. You can trim off any sides of the tail that are showing beside the head. 4.Notice, that your mermaid’s paper hair piece has lines for cutting. One has a straight line (shape this into a zig zag fringe if you wish), the other is curved. Cut these lines out. Yes it is a little fiddly, but you can do it. 5.It is now possible to insert the “head piece into the hair piece”. Secure in place with a little glue. 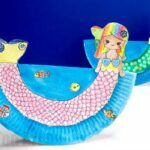 6.Now it is to decorate your mermaid – add the face (we love a bit of kawaii faces!! ), had flowers or shells to the hair, if you have some cute sequins use those as the mermaid’s bra or draw your own. 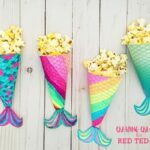 With the tail – draw on pretty scales or have fun with glitter glue and sequins. This is the best bit!!! 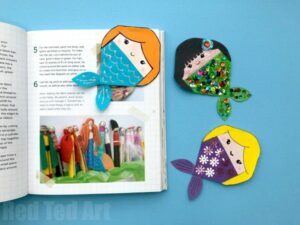 Let dry fully and your paper mermaid bookmark diy is FINISHED!! Hooray. 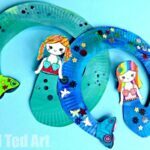 If you are using the handy mermaid coloring sheets the assembly process is even easier and quick. Cut out your head (and hair combined) piece. Cut out your tail. Remember to “snip” your harms, as again, you will need to free that part up to allow the arms to pop over you book. And all include Hug a Book Bookmark Printables for your convenience! 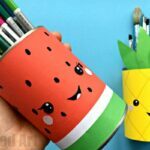 Happy Bookmark Making and Summer Crafting! Just under the underscore “PRINTABLES”?